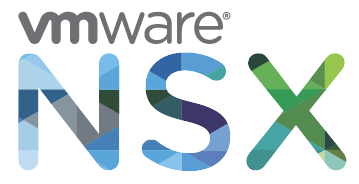 This guide is not intended as a comprehensive guide to fully understand all aspects of NSX. It's just a quick deployment guide with some tweaks for low resource Homelabs. Prepare your vSphere Platform (vCenter Server Appliance, ESXi Hosts, Cluster and dvSwitch). 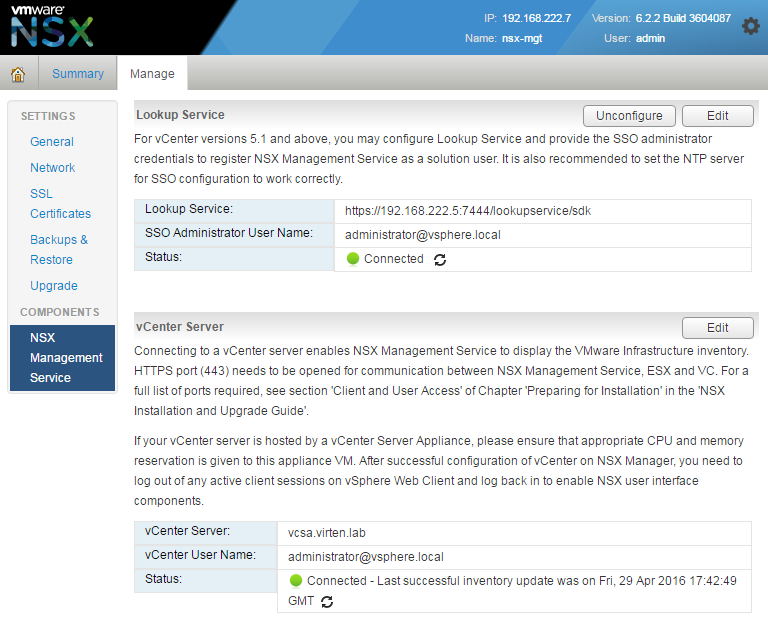 I recommend to update everything to the latest version available, which is currently vSphere 6.0 Update 2 and NSX 6.2.2. 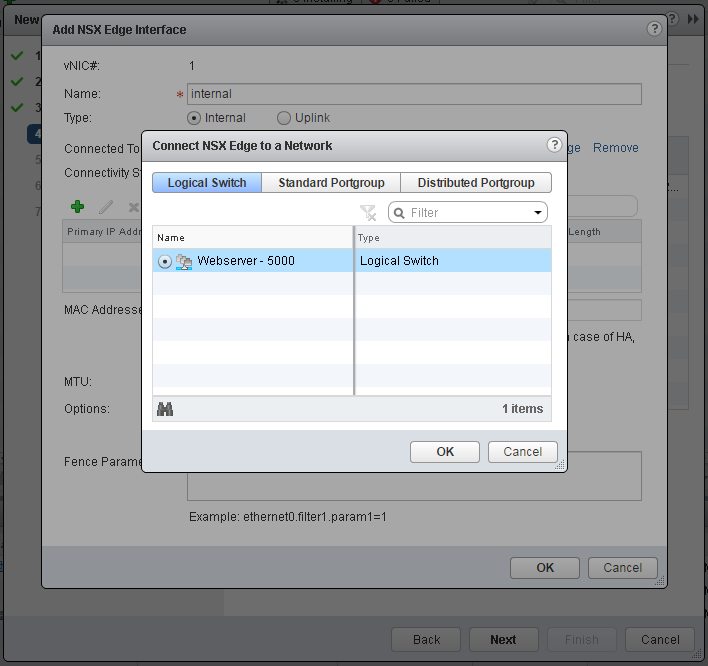 Configure a NTP Server for ESXi Hosts and the vCenter Server to ensure time consistency. 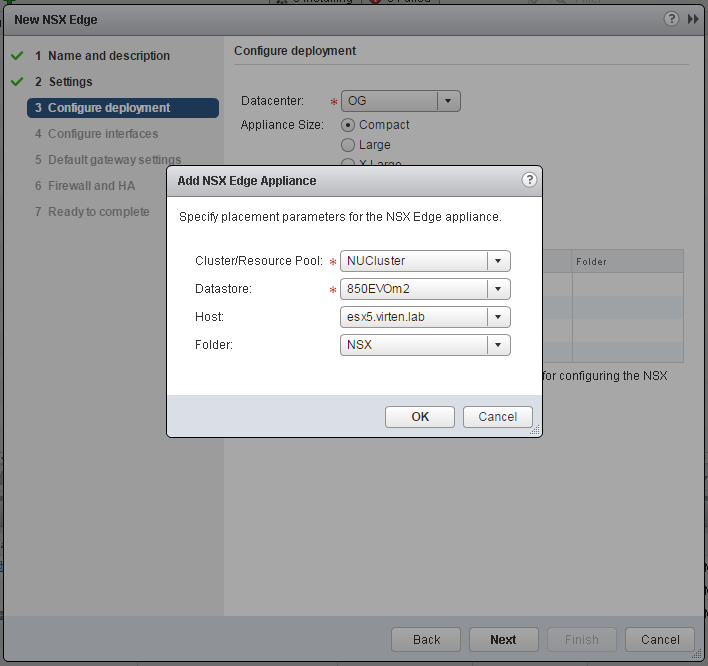 Deploy the NSX Manager Appliance, provided as OVA (Download: NSX 6.2.2). The deployment wizard is pretty straightforward, nothing special here if you have ever deployed a template. Make sure to configure a NTP Server, and enable SSH. 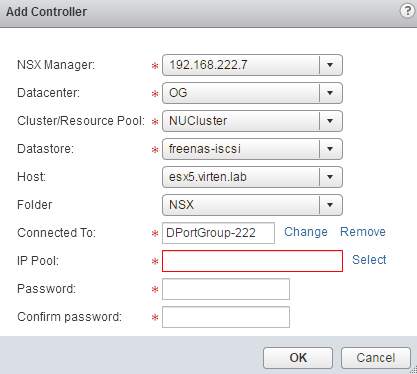 The NSX Manager needs to be registered with the vCenter Server. 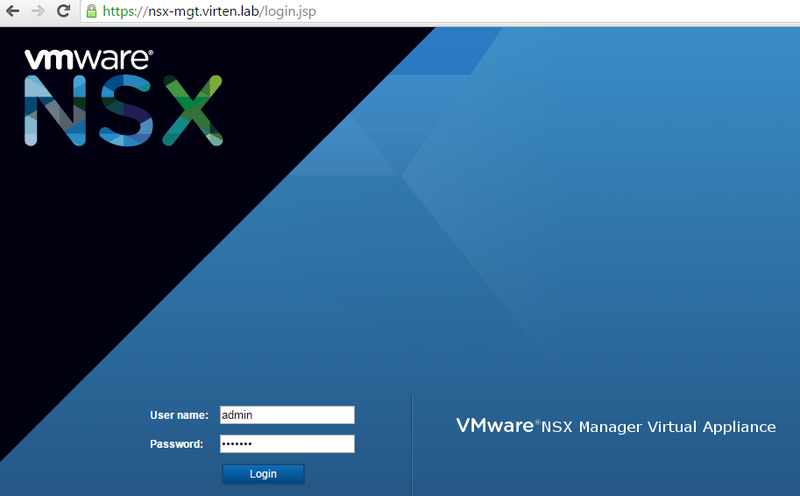 Open the NSX Manager with a browser and login as admin, with the password configured during the deployment. 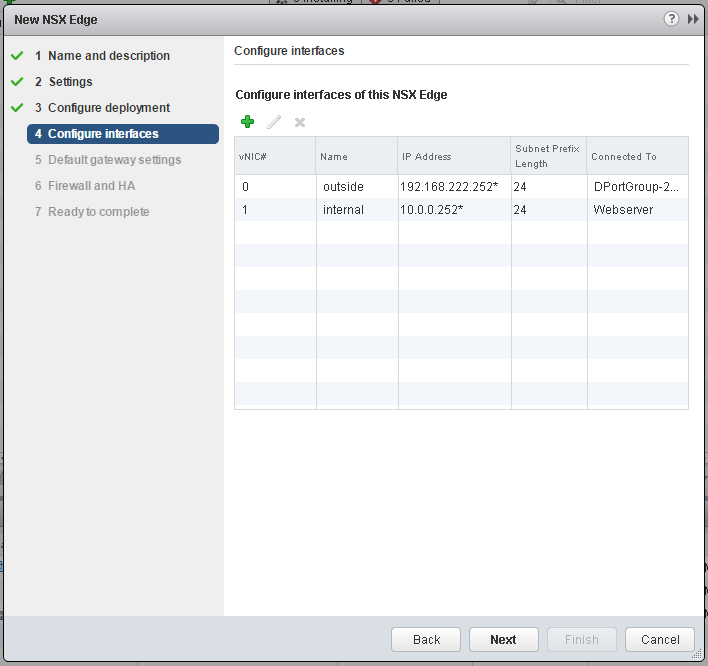 The first part of the configuration is to deploy NSX Controller nodes which are representing the Control Pane of NSX. NSX Controllers are Virtual Machines. 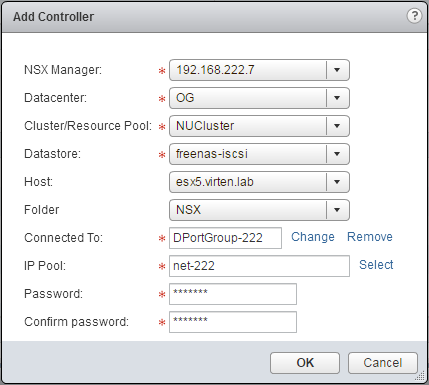 At least 3 NSX Controllers are required for redundancy. Click the + symbol to deploy the first controller. 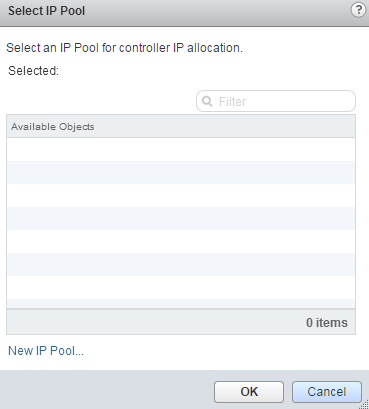 Select the options for the NSX Controller until the IP Pool configuration and click Select to select or create an IP Pool. Enter Network details. This should be the same layer 2 network as your vCenter Server, ESXi Hosts and NSX Manager. 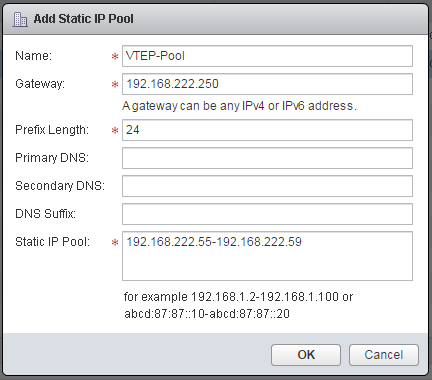 NSX Controllers are automatically configured with IP Addresses defined in the Static IP Pool. 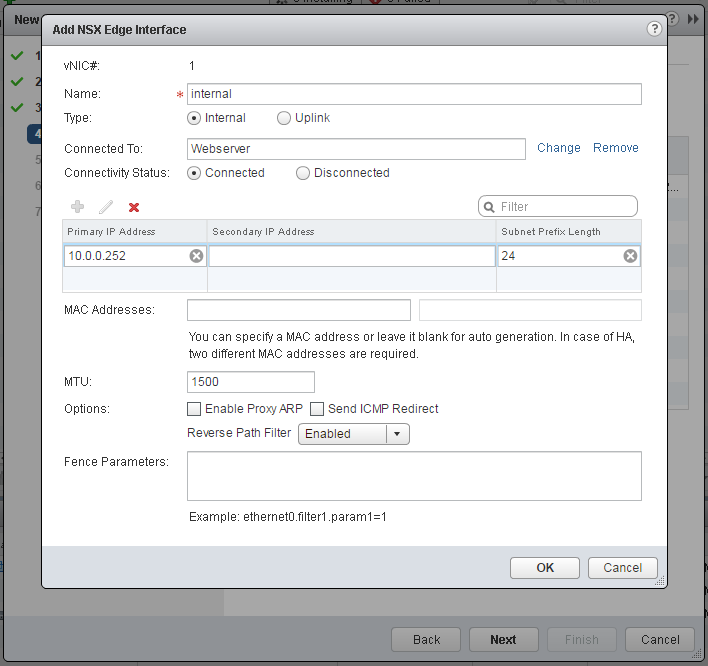 Configure the range with the number of IP Addresses you want to reserve for NSX Controllers. Wait until the deployment has been finished. 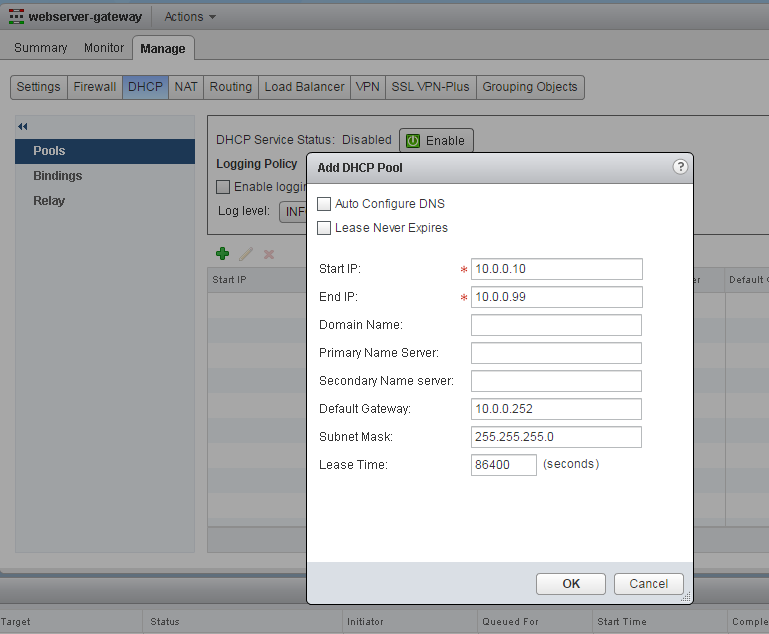 Deploy 2 additional controllers in the same IP Pool and wait until all controller nodes are deployed and connected. NSX Controllers are preconfigured with 2 vCPU and 4GB Memory. 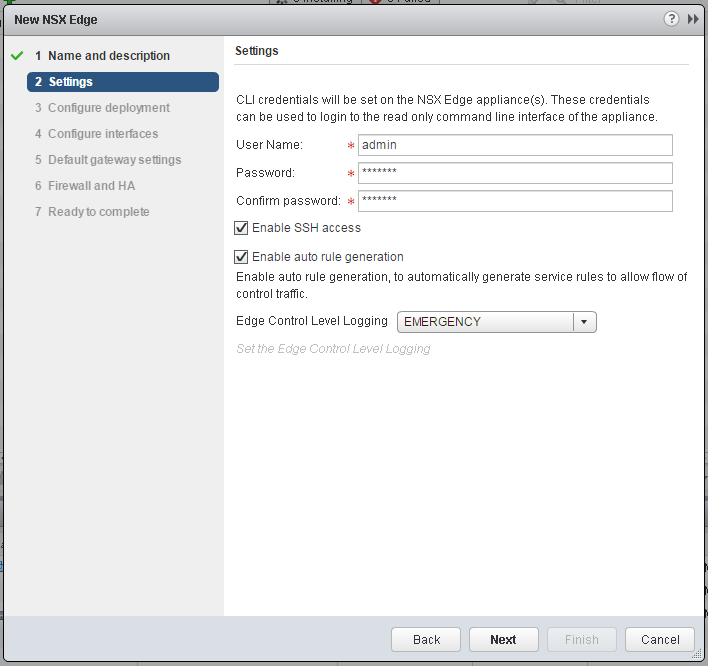 For your tiny (unsupported) homelab you can also reduce NSX Controller resources, but this is a little bit more tricky because the "Edit settings" function is blocked by the vCenter. To disable vCenter Server protection you have to delete respective entries from the VPX_DISABLED_METHODS table. This method is also described by Tom Fojta. 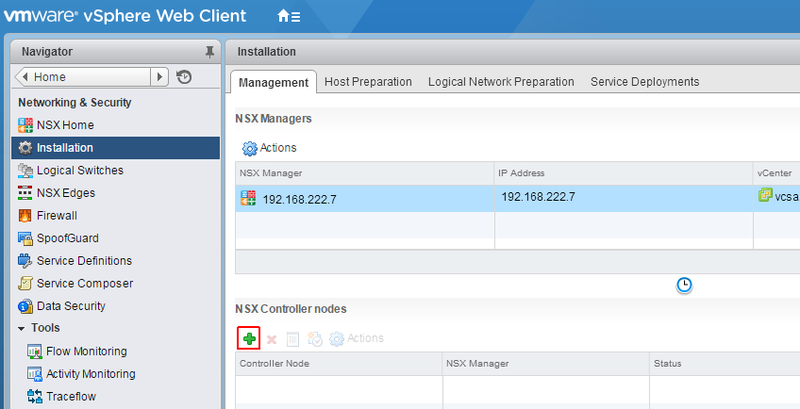 Now you have to prepare ESXi Hosts to be compatible with NSX. Navigate to Network and Security > Installation > Host Preparation, select your Cluster and click Install. This will install 2 VIB on all ESXi hosts in the Cluster. The installation is completely transparent to virtual machines. Maintenance Mode is not required. Refresh the vSphere Client to check the Status and wait until the installation has been finished. 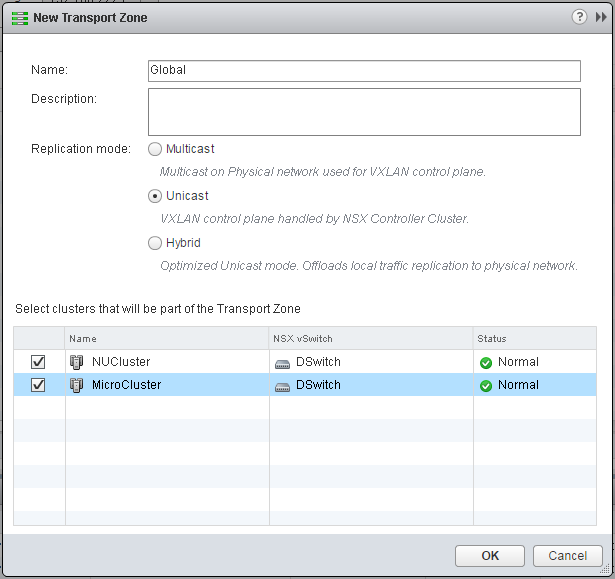 Add a Global Transport Zone and set the Replication mode to Unicast. 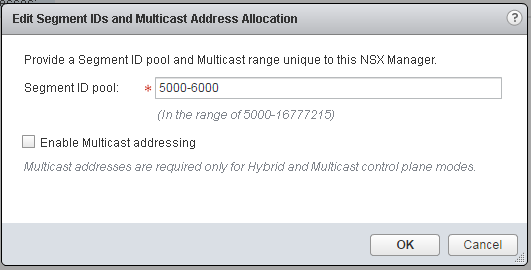 This setting allows NSX Controllers to talk to each other without any multicast requirements on physical switches. Select all clusters that needs to be part of the Transport Zone. Name the Logical Switch and set the replication mode to Unicast. Set Admin credentials and enable SSH. Configure Edge Interfaces. Place one interface to your physical connected portgroup and a second to the internal Logical Switch. Finish the deployment wizard and wait until the deployment has been finished. The VXLAN is now connected to the physical network. For ease of use I am going to enable DHCP on the logical switch. Doubleclick the new edge gateway and open the DHCP tab. 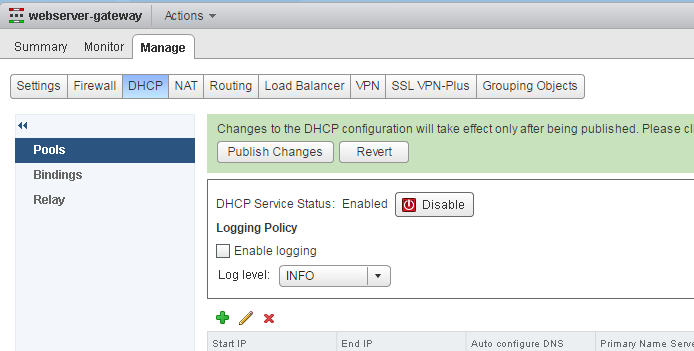 Activate DHCP and publish changes. Congratulations! You have successfully deployed NSX in your Homelab. The Virtual Machine can communicate with the physical network through the Edge Gateway. very informative in a very simplistic way, very useful for beginners. If •vSphere Distributed Switch (dvSwitch)is a requirement for NSX, but only available in vSphere Enterprise Plus, how can you set it up in a lab that does not have an Enterprise + license? I think the license for nsx automatically license you to use distributed switches. 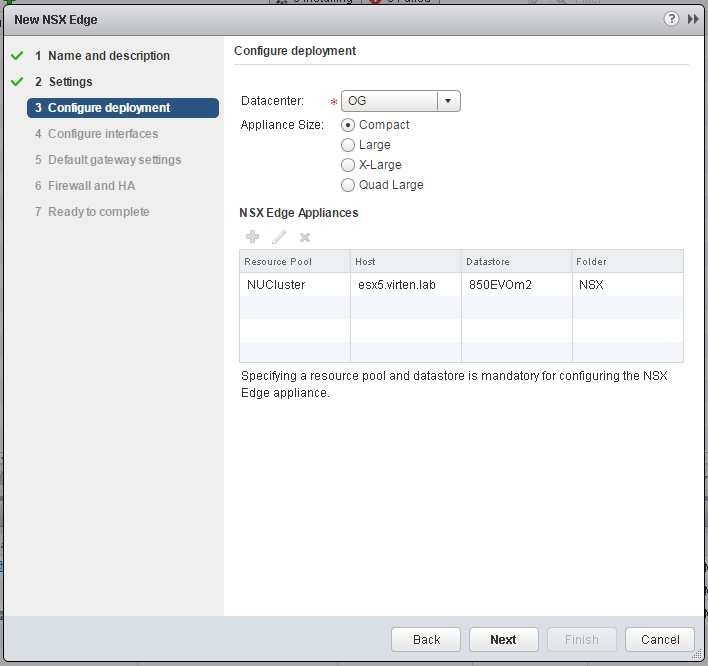 So what ESXi versions are NSX compatible? 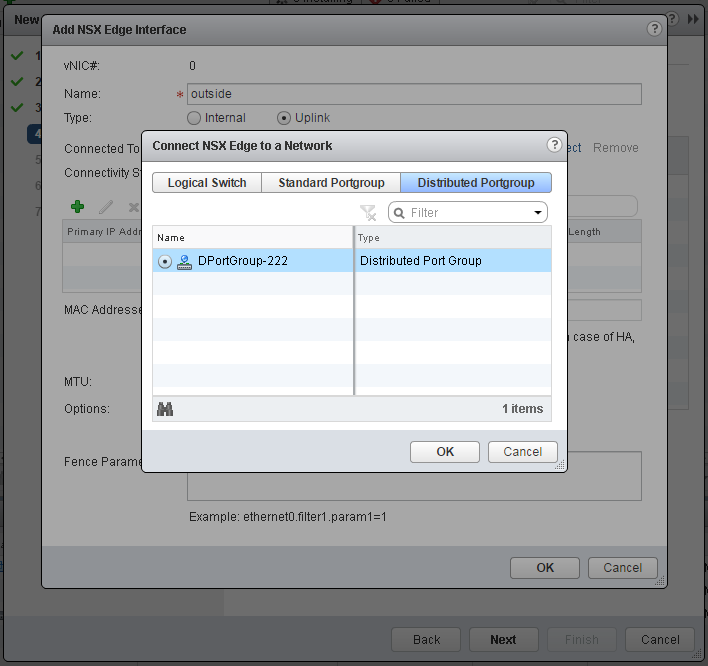 All versions of NSX 6.2 are supported with all versions of ESXi 5.5 and 6.0. Nice article, best on the net (including youtube), i have seen so far. VMware have made NSX too complicated, but then again all VMware stuff are like addons to esxi. They need to rethink NSX from a 'core' respect, meaning how much of NSX can be embedded into esxi, can they make the code smaller/lighter/faster, remove old code, consolidate stuff that does the same fuction (eg: vswitch & dswitch). 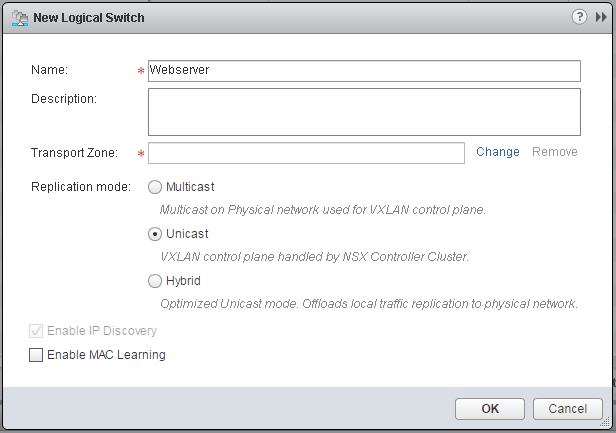 We have vSwitch, dSwitch, and now nsx-Switch, which switch will they add next. NSX Manager - this looks like the central hub for all networking information (this should be part of vCenter). NSX Controller - This keeps the network traffic within the local esxi host, but uses VTEP to send traffic to another host, doing so limits the traffic on your physical switches (this tech would be nice if embedded in esxi with the VTEP, also have the option of adding a virtual one). 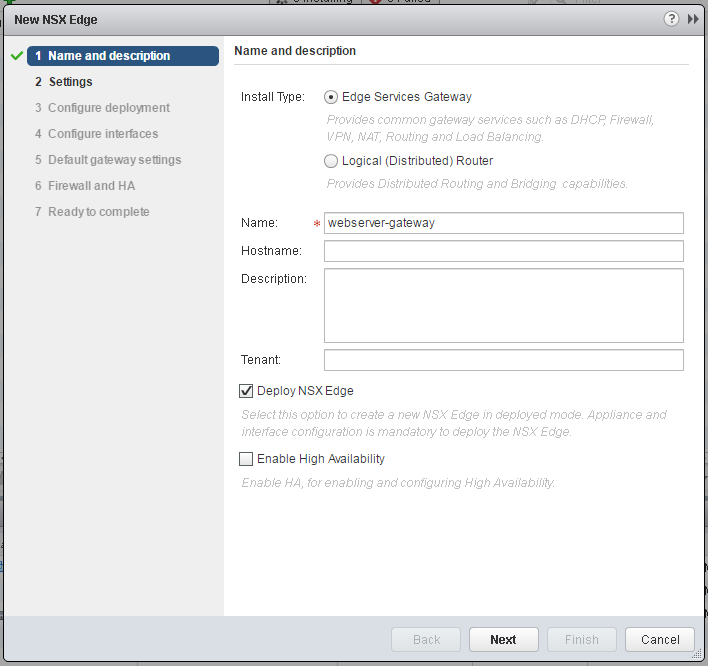 NSX Edge - this looks like a simple router (maybe add it to the contoller or embed it into esxi). While reading this i keep thinking about AWS-VPC, with subnets and security group. If VMware can get NSX as simple as that, then they would not be able to sell esxi/vshere/vcenter without NSX, it would be the de-factor for anything networking in ESXI. Yes indeed ..more linux appliances = more resource , larger attack surface DUH and more to go wrong ..sigh ! Does the 90 days demo license come with NSX 6.22 when you download it? to create a test environment, do I need to setup a cluster too, or can I do without? hi, really nice step by step for newbie. by the way, can anyone explain me what is the different about'Uplink' and 'Internal' stuff ? I am really newbie about network. The Uplink interface connects to an external network (Standard dvPortGroup). The Internal interface connected to a VXLAN network (Logical Switch). So, if I create a new VM, where should I attach the connection ? using dvPortGroup ? or using Logical Switch? Very useful for initial Home Lad Deployment. Nicely cover small points, thank you for sharing. Does it need physical Router or switch? Where does VM stands and how will it connect to external and internal network? I have successfully deploy the guide but my vm can ping the external network and also default gateway of edge device which is 10.0.0.252. The VM successfully get the dhcp from edge device. Sorry typo mistake. VM cannot ping the external network and default gateway. Does the system you want to ping in the external network have a route to your VM network? I have not added any route. 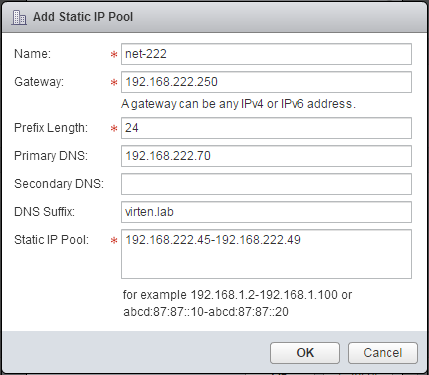 Sorry, but I need know how to resolve the VLAN ID in the vDS? 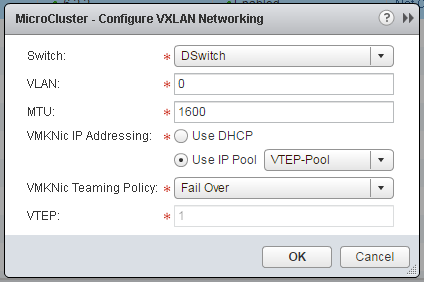 Each PortGroup need had a VLAN ID but if dont have physical switch How to do? Here is another take on it. Deploying two edge devices across two segments to isolate clients from each other.